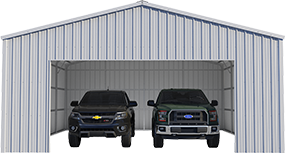 You may be in the lucky position of knowing exactly where you want to place your new steel barn. 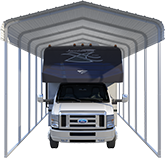 However, if you have multiple options or you’re in the beginning stages of planning, settling on the best location for your VersaTube barn may be your biggest challenge. Don’t worry! While you’re mulling over the best location for your new barn, we have a few recommendations to help you choose the perfect site. Before you get serious about a specific location on your property, start by checking your local zoning regulations. Save yourself the disappointment of finding the perfect spot only to discover that zoning laws prohibit building that close to the boundary line. You might find there are even regulations about the appearance of your barn, how large it can be, and where it needs to be located in proximity to your house. Understand your local zoning laws and you’ll be a lot more confident moving forward with your build! However you’ll be using your barn, you’ll almost certainly need electric and water. The closer you are to existing utilities, the lower your costs will be. This one will differ based on your circumstances and how you intend to use your barn, but be sure to consider the other buildings, roads, pastures, and assets already in place. Are you building a barn that will be used for housing equipment or hay? Being close to the road will be convenient. If your VersaTube barn will be a horse barn, being close to the driveway will allow the vet convenient access to your animals and will make for easy manure removal. Being close to a pasture for grazing would also be beneficial. Keep in mind the comfort for your home and other buildings as well. For security and convenience you probably want your barn to be close to your home but if you build too close, manure and other odors can be a problem of their own. Possibly the most important aspect of your site is that it is level and has good drainage. If it collects standing water or isn’t level you’ll need to bring in fill to correct the problem, which could have a significant impact on your budget. As you begin your search for the ideal spot, you can use Google Maps to check the terrain. That can help you identify high ground and also spots that might collect water. Secondly, check your property during and after heavy rainfall to identify the areas where water stands. Finally, when you have a good idea of which location you’ll pick, stake it out. You’ll get a better idea the footprint your barn will have on your property as well as any drainage or leveling issues. 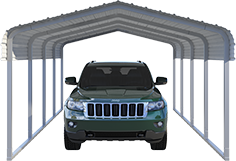 When choosing your site for your VersaTube barn, climate should be a big consideration. If you’re building in cold climes, position for good sun exposure with a solid wall against prevailing winds. For a hot climate, situate your barn to avoid the worst of the day’s heat. When you consider these five points we’re sure you’ll be able to pick a location for your barn that you’ll be happy with! Have your site picked? Now it’s time for the fun part - choosing and customizing your barn. Check out our barn models here!